Note: A progress report is sometimes called a field report or a quarterly / six monthly report. Progress reports are used by a project team to update the donor or head office on the status of the project (for example, at the end of every quarter or 6 month period). There are also times where progress reports are shared with partners and stakeholders. In many cases the donor or organisation will have a specific template that must be used for a progress report. If they don’t have a template then you might find this template useful. You need to to update your donor or head office on the project. You need to update your partners or stakeholders on the project. You are a donor or head office and you want your project teams to update you regularly. 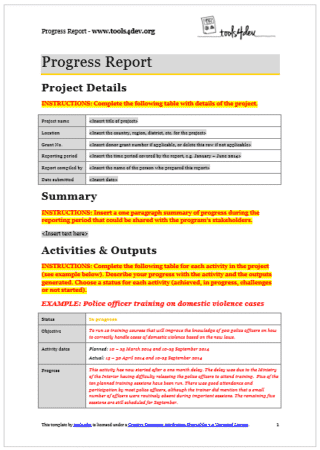 Your organisation or donor already has a standard template for progress reports (in which case use their template). 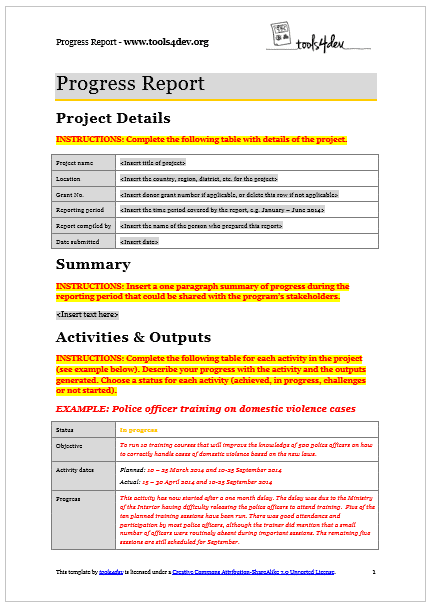 The Progress Report Template by tools4dev is licensed under a Creative Commons Attribution-ShareAlike 3.0 Unported License. All other content is © tools4dev.